It’s summer. Berry season. And this Pan-fried Chicken with Strawberry Salsa dinner has summer written all over it. It was my Memorial Day dinner, because, after all, Memorial day does mark the start of summer here in America. Mother Nature, unfortunately, did not get the memo about summer having begun. Either that or she left Seattle for the long weekend like a horde of other folk who hurtled up the I-90 or down the I-5 in droves. 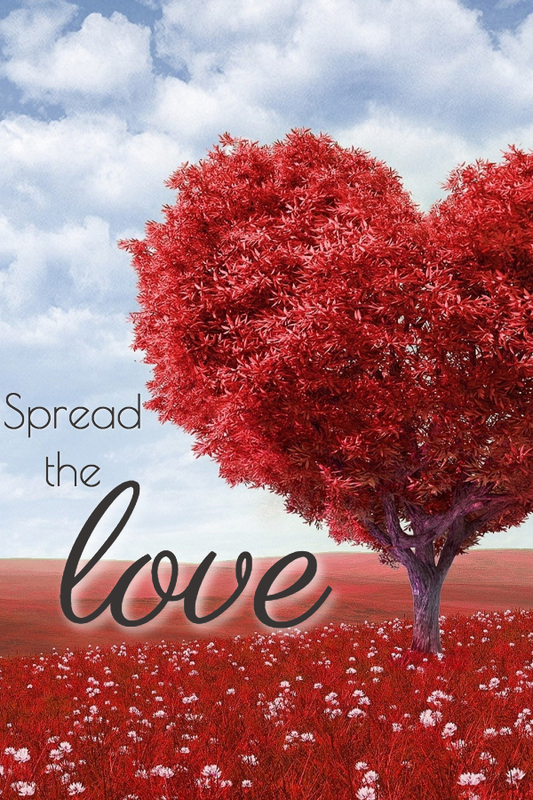 Despite the weather being pretty damp and dreary – or maybe because the weather was pretty damp and dreary – I had a rush of blood to the head, and, on the spur of the moment decided to cook like there were people coming over. After I posted a quick ‘phone pic on Facebook, people were wishing they had come over. I see how you are, people. It’s all about the food. Because it is now summer – and regardless of what the weather may have looked like on the official first day – I decided that we all needed some Strawberry Salsa in our lives. Strawberries make the world a better place. Unless you’re allergic to them, in which case, not so much. Not only does Strawberry Salsa just make you want to eat everything it covers, it also tastes like summer. I’m not a traditional salsa kinda gal. Tomato based sauces have never really floated my boat, and spicy hot is not my ball of wax. I can take traditional salsa or leave it, and almost invariably I leave it. In England that’s not too hard to do, but stateside, salsa pops up all over the place. And all the time. It seemed only right that I should fill my personal salsa void with something red and yummy. So I did. A long while ago I saw in a magazine – probably while waiting in my Therapist’s office since that’s the only place I see magazines – a recipe for Strawberry Relish, and I never forgot it because it looked so fantastical, although I didn’t think to do anything sensible like take a ‘phone photo so I could remember the ins and outs and whys and wherefores. And because I couldn’t remember anything other than it’s fantastical-looking-ness, I just made my own up; although how much of the recipe in the magazine became quietly lodged in a corner of my brain we shall never know. 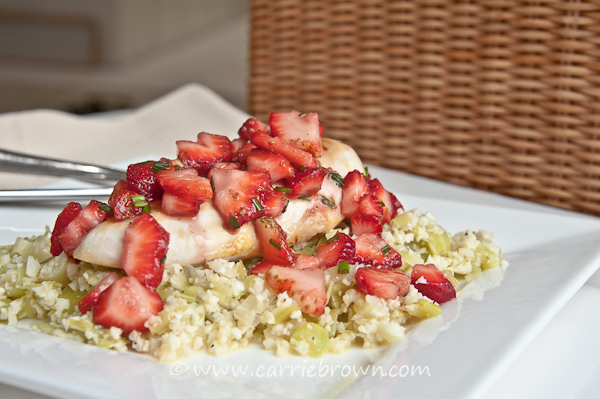 The dressing for this Pan-fried Chicken with Strawberry Salsa is tart yet sweet, and macerating the strawberries in advance means you get an almost syrupy sauce which runs off into the Leek and Cauliflower Risotto (see image above) to create a mix of flavors so delicious I don’t even have the words. And that was when it was hot off the press. 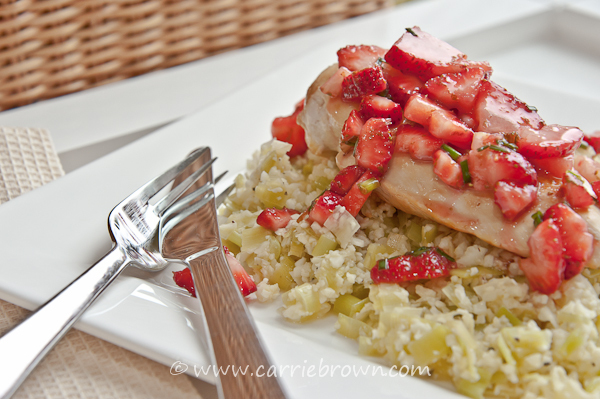 That night I put the risotto in the bottom of a Pyrex dish, laid the chicken on top and spooned the rest of the strawberry salsa over the top, put the lid on and slung it in the ‘fridge for the next day’s lunch. I was expecting it to be OK. Secretly, I was resigned to it being passable. Imagine my delight then, when I discovered it was even better cold the next day. I will be making it again, expressly to let it get cold overnight in the ‘fridge. It would make an absolutely smashing, cold, summer lunch. And if you serve it hot it will stun your dinner party guests, without taking all day to make. It’s fast, simple and sane. I highly recommend that you make this Pan-fried Chicken with Strawberry Salsa as soon as possible. It will change your summer, forever. 1. At least 30 minutes before you start to cook the chicken, place the hulled, sliced strawberries in a bowl with the lime zest, balsamic vinegar, xylitol, and fresh chives. 2. Mix well until the strawberry pieces are completely coated in liquid and xylitol. 3. Leave to macerate, stirring every so often. 4. Melt the coconut oil in a skillet, and add the chicken breasts. 5. Pan-fry the chicken until they are golden brown on both sides, about 15 minutes, making sure that they are cooked right the way through. 6. 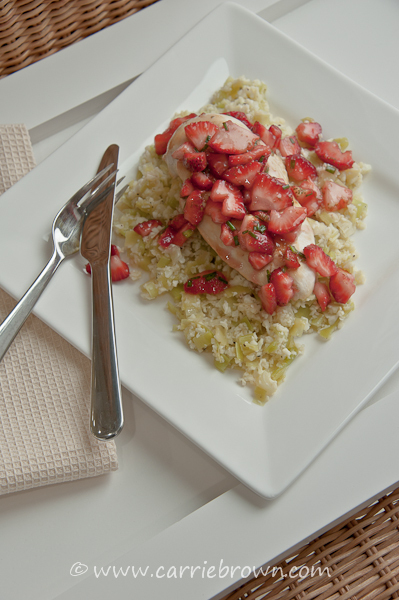 Place the chicken on individual plates or a serving dish and spoon the Strawberry Salsa over the top. Use skinless or skin-on chicken depending on your goals. 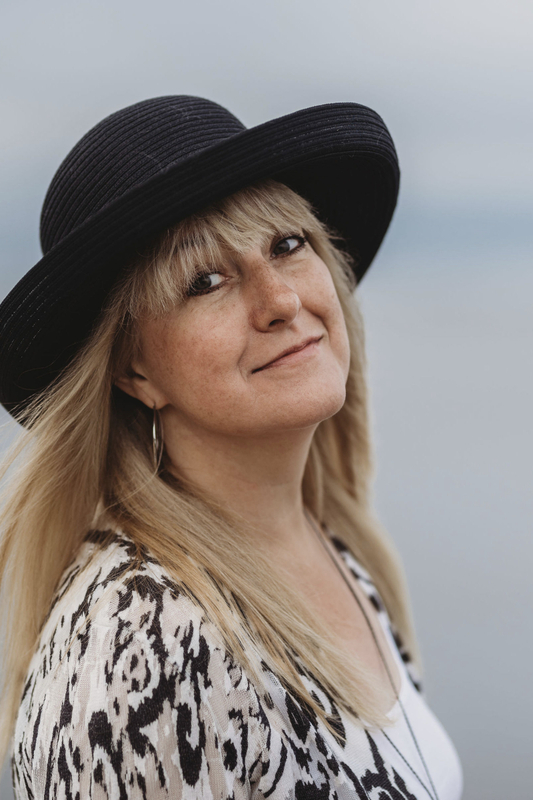 Julie - Just found your website by listening to the Ketovangelist podcast. I sure wish that your recipes listed the macros…is that a possibility? You can easily get a rough estimate of what you actually ate by running your data through a tool such as this one: https://nutritiondata.self.com.